This December and January are key months for planning for a successful 2017 planting season and strong harvest. The experts at FS Construction Services remind you that now is an excellent time to take advantage of special maintenance offers. Use downtime within your daily business activities to set the table for a successful new year for you and the farmers who depend on your company. Growers invest in premium seeds to ensure top performance. 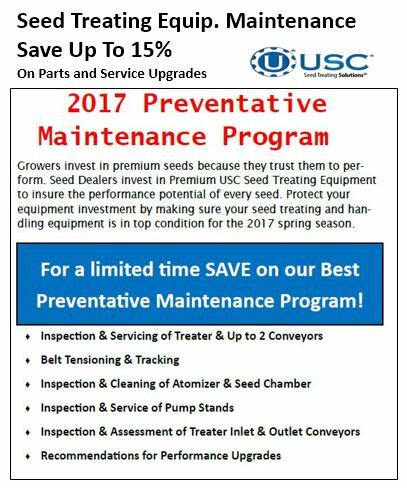 As a seed dealer, you invest in premium USC Seed Treating Equipment to insure the highest possible performance potential for your customers and each individual seed. Delivering quality, performance and results starts with equipment that is well maintained and ready for the long days ahead. Now through January 31 our basic inspection package is only $495 plus, you can save up to 15% on parts and service upgrades. As an authorized USC Dealer, you can count on the professionals at FS Construction Services to help keep your USC Seed Treating equipment in operating like new for years to come. Give the team at Gateway FS Construction Services a call at 866-551-3454 and let us help you meet your specific needs. We look forward to providing you the best customer service experience. At FS Construction Services, we know that farm accidents and work stoppages often happen due to inadequately maintained or faulty equipment, but preparation can prevent these issues. Now is the time to inspect your operations’ grain storage and handling equipment to identify and address possible problem areas. 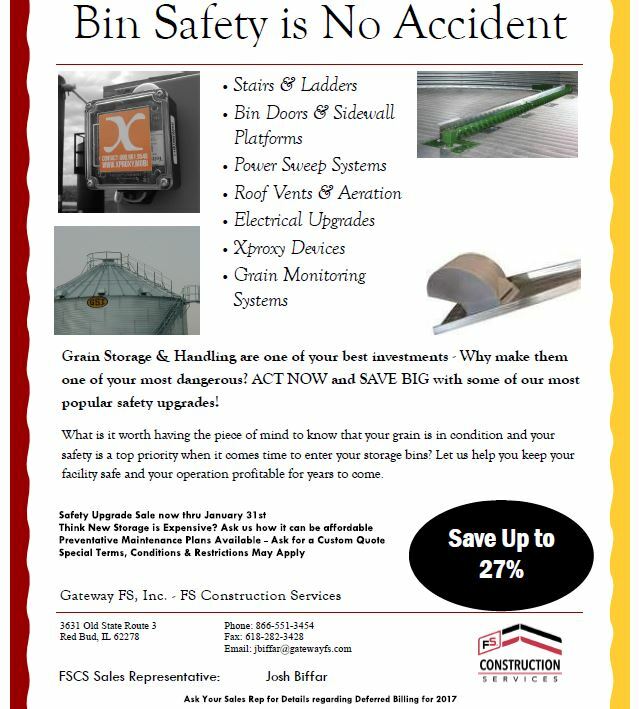 Proper maintenance of existing equipment or installation of safety upgrades help ensure accident free operations, protect your revenues and eliminate downtime and injuries. The FS Construction Services safety upgrade sale includes replacement parts and new equipment that can make your equipment as dependable as new however, the key is to evaluate, identify and replace any potential problems. Ideally, there your storage system will have NO safety issues which need to be addressed however, it pays to schedule an inspection to verify. If any issues are detected, FS Construction Services will provide a no obligation quote to address the issues. Ensure bin safety on your property is no accident. Contact FS Construction Services today to find out more and get a custom quote. You could save up to 27% from standard packages. Think new storage is too expensive? Let us show you how affordable it can be. Whatever your farm repair or maintenance needs, you can count on our professional team at Gateway FS Construction Services to keep your facility safe and your operation safe for years to come. Give us a call at 866-551-3454 and let us help you meet your specific needs. We look forward to providing you the best customer service experience. FS Construction Services, along with our partner, Raynor Garage Doors, are proud to offer our customers the newest and most energy efficient garage doors on the market today, the Aspen™ Series Steel Residential and Commercial garage doors. Long known for providing the highest possible quality and widest array of garage door and opener choices, Raynor’s newest product offers even greater reliability and performance. The Raynor Aspen Series steel garage doors provide the ultimate in safety, quality and energy efficiency. This beautiful door is made with a three-layer construction design. Plus, the Aspen series features Raynor’s proprietary WeatherLock™ section joints. This energy efficient design provides unyielding strength, section joint seal and thermal break to lock out the blustery cold drafty air of winter and sweltering summer heat. These commercial and residential doors also feature Raynor’s Neufoam™ technology. Neufoam is a poly urethane insulation that fills 100% of the interior cavity resulting in a R-Value of up to 18.0. This unmatched performance is sure to save on heating and cooling bills throughout the year. With new Raynor Aspen Series garage doors, you can be assured of exceptional performance but you will also be impressed with the design options this line of doors provides. With seven panel options, eighteen window options and ten standard colors/finishes, you are sure to find a door combination to fit your taste. Finding the right style door to match your home or business has never been easier than it is right now. Plus, Raynor offers a multitude of hardware options for you to choose from. Have a specific color you would like to match? The Raynor OptiFinish™ paint process allows you to pick from more than 1,800 Sherwin-Williams color options. 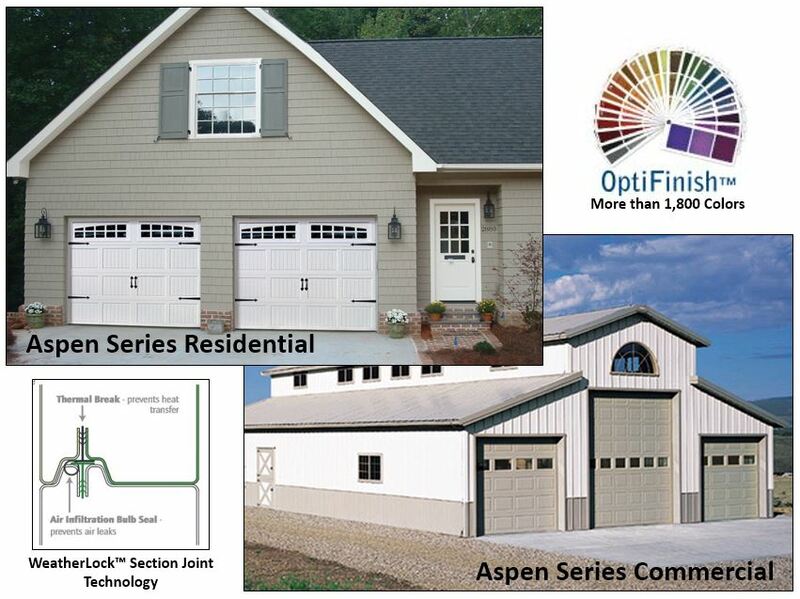 Contact the team at FS Construction Services today to talk about the new Aspen Series of Raynor garage doors. And as an authorized Raynor dealer, we will install your new garage door system for you. Then we will continue to work with you and provide the best available garage door system maintenance and service to ensure your new door stays operational for years to come. Whatever your garage door or construction needs, you can count on our professional team at Gateway FS Construction Services. Give us a call at 866-551-3454 and let us help you meet your specific needs. We look forward to providing you the best customer service experience.